Reach for a Dream is a fundraising organisation that uses any gained funds to assist children suffering from life-threatening illnesses, by realizing one of their dreams and supporting the families. 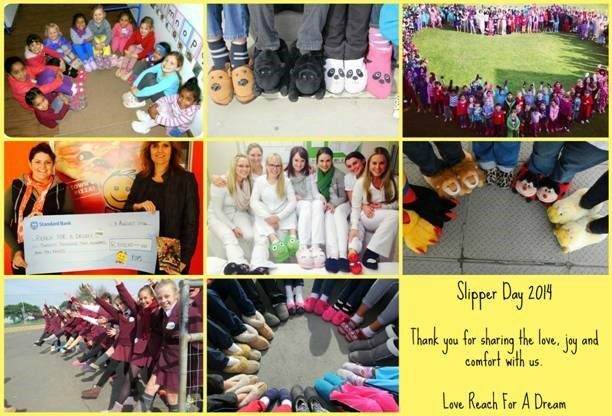 Fundraising is done throughout the year, and one such campaign is the well advertised "Reach for your Slippers" Day, which took place on 1 August 2014. Together we managed to raise R4620.00 for the Reach for a Dream Foundation! As their website states: “We believe in the power of dreams. We encourage children to use their dreams to fight life-threatening illnesses. And we seek as far as possible to make dreams from true. Our vision is to grow the Foundation, enabling us to continue giving hope to children fighting life-threatening illnesses through the fulfilment of their dreams, and to further help as many children facing these illnesses through our national projects.